The Axia Offroad billet fire extinguisher mount is a work of art. Its aircraft grade 6061 aluminum and stainless steel components are precision machined for a perfect fit. All contact points are o-ringed so that it will not wear or rattle in even the.. 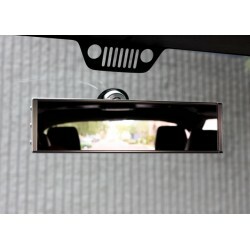 This is a slide on 9" wide mirror that uses the standard windshield rearview mirror mount found on most vehicles. The Axia Offroad 9” wide panoramic rearview mirror offers a low distortion crystal clean view with its shatter resistant g.. The solution plate is laser cut from .090 aluminum and formed using a custom die. This forming process not only greatly increases the strength and rigidity of the plate, it also allows us to address several issues left untouched by existing license p..
A must for all jeep owners the all new Gobi Jeep JK Driver side ladder bolts on to the rear of the Gobi roof rack and is designed to tilt back with the rack for soft top retraction or hard top removal. Now you can climb on to your roof rack for easy ..
A must for all jeep owners the all new Gobi Jeep JK Passenger side ladder bolts on to the rear of the Gobi roof rack and is designed to tilt back with the rack for soft top retraction or hard top removal. Now you can climb on to your roof rack for ea.. The Gobi Ranger Tool box is designed to fit the contour of a Gobi Ranger roof rack. Uniquely design, with plenty of lockable storage space for tools, tie downs, tow straps, gloves, winch accessories, extra fluids, jumper cables… you name it! S.. Designed specifically to fit a Gobi Stealth roof rack’s low profile; Measuring 22”x14”x4” the Gobi stealth design holds plenty of lockable storage space for tools, tie downs, tow straps, gloves, winch accessories, extra fluids.. The all new Gobi Jeep JK Sun roof insert is designed to attach seamlessly over your sun roof for an additional 10.4 sq.ft. (.97m2) of cargo space. With a 150 lbs. ( 68.04kg) load limit it will come in handy with a full complement of passengers. Black.. The Gobi Ranger "locking" High Lift Jack attachment is designed to fit snug against the side of the Gobi Ranger roof rack placing the Jack below the level of the upper sides of the rack. The design helps prevent tree limbs from becoming ent.. This plug is used to fill the hole that is left behind when relocating your license plate from its factory location. It is a genuine Mopar part ans simply snaps into place once the OEM tag mount is removed. ..